The main memorial centre for the Rwandan genocide. Located logistically conveniently in Rwanda's capital city Kigali. It's the No. 1 genocide-related site for foreign visitors to the country and a top priority for any dark tourist in Kigali. More background info: For background information on the topic in general see under Rwandan genocide and Rwanda. The Kigali Memorial Centre in the district of Gisozi (hence the name it is most commonly filed under) was opened in 2004 on the 10th anniversary of the genocide and is co-run by the Great Britain-based Aegis Trust (a genocide prevention NGO). 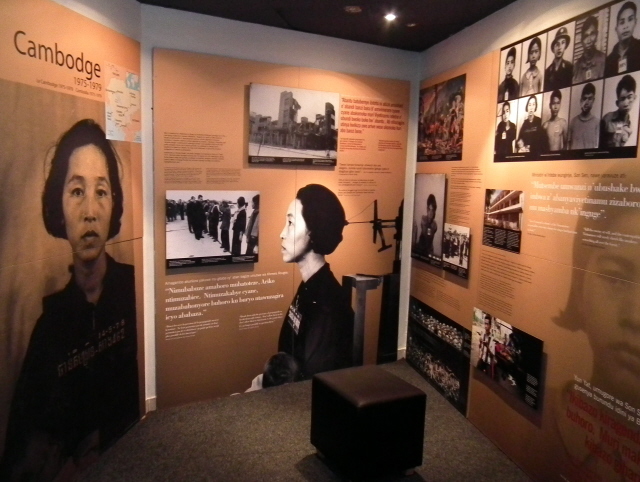 In addition to the memorial proper and its exhibitions there's also a documentation centre and an education department. Rwandan schoolchildren are also frequently carted to the centre by the busload to be educated about their country's grim recent history, which is a good thing, of course. The Aegis Trust was also involved in the design of an exhibition at the grim Murambi genocide memorial in the south of Rwanda. Furthermore, in association with the Rwandan National Commission for the Fight against Genocide (CNLG) as well as various research institutions abroad, Aegis helped compile the "Genocide Archive Rwanda", an overwhelmingly comprehensive resource of material relating to the topic. Not least because of these resources, the Rwandan genocide can now be taken to be the best, most comprehensively researched case of genocide other than the Holocaust. If you really want to delve into the subject matter, you can easily lose yourself into the study of it forever. (See genocidearchiverwanda.org). A more modest introduction is provided by the Gisozi Centre's brochure, which you can obtain together with an audio-guide at the entrance and which gives a good overview of the Centre's exhibition. The site of the Gisozi Centre is also grim in itself: it is the site where about a quarter of a million victims of the genocide are buried. Thus a complex of mass graves is part of the Centre. Apparently there are also plans for further expansion of the Centre. It certainly remains a site whose future development is to be monitored. What there is to see: This is the country's most important, largest and most visited Genocide Memorial Centre (for others outside Kigali see under Rwanda). It is geared towards foreign visitors better than any other. It thus has to be high on the priority list of any traveller in the country – and for the dark tourist it has to be ranked as one of the most important must-see sites in the world. The Centre is a large complex comprising of various distinct parts. Outside are extensive mass graves, in three sections/levels down the hillside, containing the remains of up to a quarter of a million victims. Most of the mass graves take the form of underground burial chambers sealed by large rectangular slabs of grey concrete. Only one of them – at the far north-western end – has an opening with a glass panel through which you can peek in. However, don't expect the usual bones and skulls here (as at other genocide memorials): inside can be seen a couple of dignified coffins covered in purple and white cloth (in Rwanda purple is the symbolic colour of mourning). A small sign by the side admonishes visitors not to step on the mass graves – apparently it happens (cf. the Choeung Ek killing fields in Cambodia)! These mass graves are supplemented by a wall of names of those victims buried here – although as yet, only a small part of the wall already has names inscribed on it. Most of the wall's area is still blank – indicating how much more research is required to determine the victims' identities before the whole wall can be filled with all the victims' names (which is the Centre's ultimate goal). In addition there is a series of "memorial gardens", which really are little more than just that: gardens. Their relative thematic connections with the genocide (apart from their names, e.g. "children's garden" or "garden of reconciliation") remain rather obscure to the visitor. The same is true for some of the sculptures contained in some sections of the gardens. For instance, there is one that looks like a fat monkey talking into a mobile phone (!?!). As you enter, there's a counter to the right. This is where you can obtain an audio-guide, book a live guide, buy the guidebook – and pay for a photo permit. 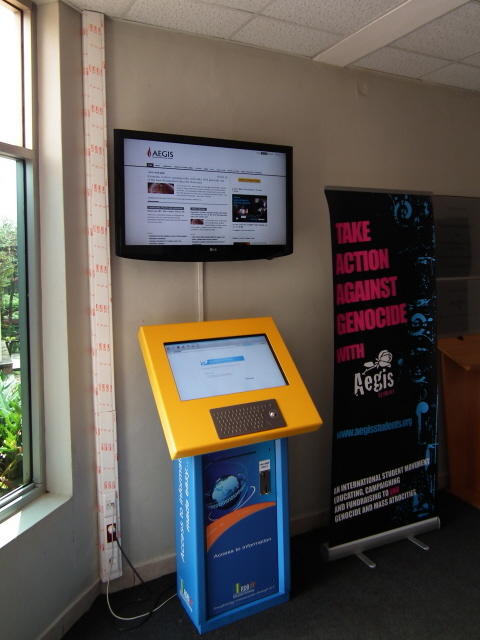 Opposite is an interactive computer station and a flat screen providing background information about the Aegis Trust. The exhibition has three distinct parts, the main one is on the ground floor, entered to the right behind the counter. It is a more or less circular route through different rooms arranged around a central hall. In this central hall, a number of wooden sculptures are the dominant feature. Some are supposed to symbolize life before the genocide, others during. They are quite abstract though, so it's not immediately apparent which is supposed to be which. The series of small rooms that comprise the more museum-like exhibition then tell the story of the Rwandan genocide. These parts of the exhibition mostly take the form of text-and-photo panels, occasionally augmented with video screens showing historical footage and/or survivors' eyewitness accounts. There are also a few artefacts, including farm tools used as murder weapons and even some victims' clothes. 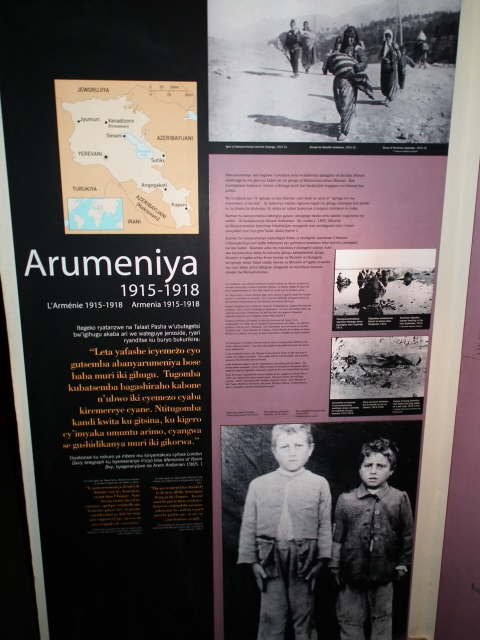 The history of not only the genocide itself, but also the complex historical background that led up to it is outlined, as well as the lasting aftermath of the tragedy. In fact, the unfolding of the genocide itself is given relatively little space (space is a bit is limited here anyway). More emphasis is placed on the build-up, on the conditions that made it possible. This is understandable, as the Centre's, and the Aegis Trust's, main guiding principle is to work for the prevention of crimes against humanity. The other is remembrance with dignity. It is probably also with a view to the latter that the full horror of the genocide is somewhat subdued in this exhibition. I've even encountered the opinion that the exhibition was "sanitized" in this respect (which I think is an exaggeration). Given that it is also aimed at Rwandan schoolchildren, this should perhaps not be such a big surprise. The balance between shocking exposure and respectful restraint is in any case such a delicate one that one shouldn't rush into criticisms of the exhibition one way or the other. Still, make no mistake: the impact is intense all the same. And some of the footage shown is quite horrific. This is true especially of some of the video clips. There are none showing the actual slaughter going on, but the images of bodies strewn out across the land, or that of the horrific wounds that even children (who survived) sustained, is certainly nothing for people with a weak stomach. Offsetting the horrific content of the main exhibitions room are corners with benches were you can take a break. Two of them are dominated by large stained-glass "windows of hope", which are specially commissioned works of art (though titles like "descent to genocide" do not sound all that hopeful). These were created by Ardyn Halter, son of an Auschwitz survivor! Following the end of the main topical exhibition, you enter a room which is full of victims' family photos hung up on the walls. This has a certain personalizing, individualizing effect, yet this is offset by the sheer number of photos. In this room you can sit down and watch more video clips projected onto a larger screen. These show excerpts from interviews with genocide survivors. All very moving. Finally, you enter a very dark, very sombre room – and in low display cabinets you can see neatly arranged rows of bones and skulls of victims. The effect is, again, restrained – certainly compared to the shocking rawness of the displays of human remains at places like Murambi or Nyamata. It is possibly less distressing here because at Gisozi the display of skulls etc. comes at the end of the exhibition, after the commodification of the story, rather than as first-thing, full-on shock element. This is doubtless a deliberate effort of toning down – also given that the Rwandan approach of displaying human remains as reminders isn't uncontroversial. At Gisozi they apparently aimed at a compromise. And in my opinion it works quite well. Back at the entrance stairs lead upstairs to the other two sections of the Memorial Centre. 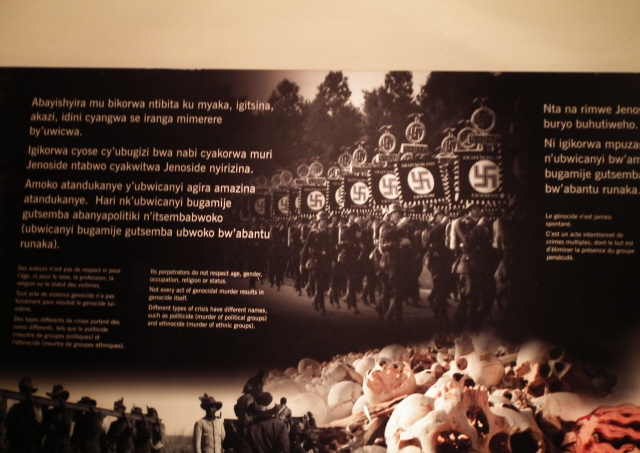 One contains an exhibition about other genocides in 20th century history, from the Imperial Germany's genocidal treatment of the Herero in Namibia in the early years of the century, via the Armenian genocide of 1915 and the one in Cambodia in the 1970s up to the atrocities during the Balkans war, especially Bosnia, in the 1990s (which overlapped in time with the Rwandan genocide – a fact that has been adduced to explain why the Rwandan genocide was so underreported in the Western media at the time: because all eyes were on the war in former Yugoslavia …). Naturally, the biggest one gets coverage too: the Holocaust. In fact, it gets two sections. One general one, and one picking out Treblinka as the prime example of a death camp. Another separate section is devoted to the many child victims of the Rwandan genocide. This is a much more reflective, less museum-like section. Only a few cases are selected, and the information given is comparatively minimal. The focus is much more on the emotional atmosphere. Unfortunately, when I visited, the museum suddenly announced that it would be to be closing early (it was Christmas Eve), so I had to rush through this final section, unable to give it the time it deserved. 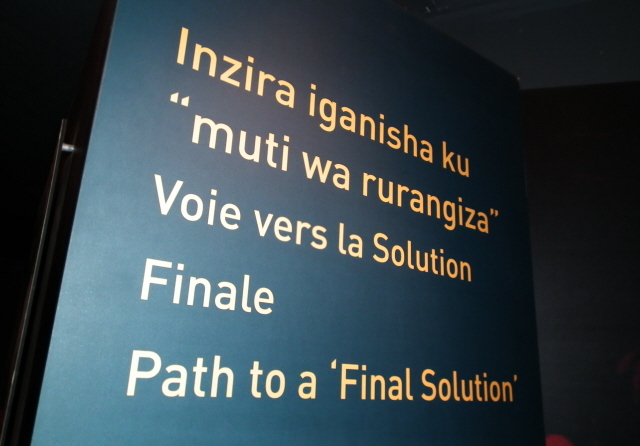 Explanatory texts in all sections of the memorial are trilingual, including English translations (alongside French) next to Rwanda's own national first language, Kinyarwanda (which always gets the largest script on the panels, indicating that the local population is considered the main target audience). 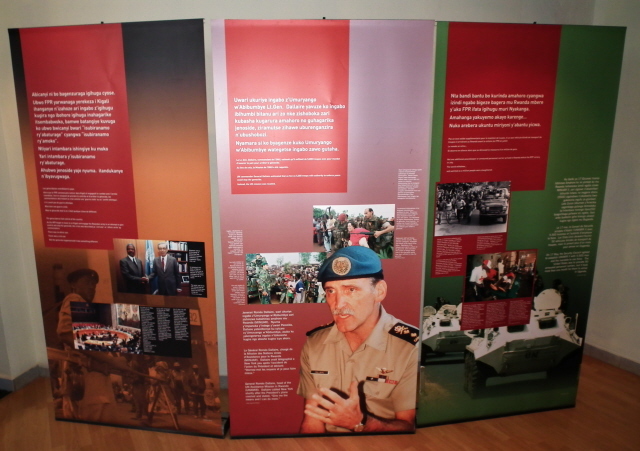 The contents of the exhibition are self-explanatory enough, but for additional info and excerpts from survivors' testimonies, you can also hire an audio-guide, which is of good quality. Live guides can also provide yet more in-depth assistance. 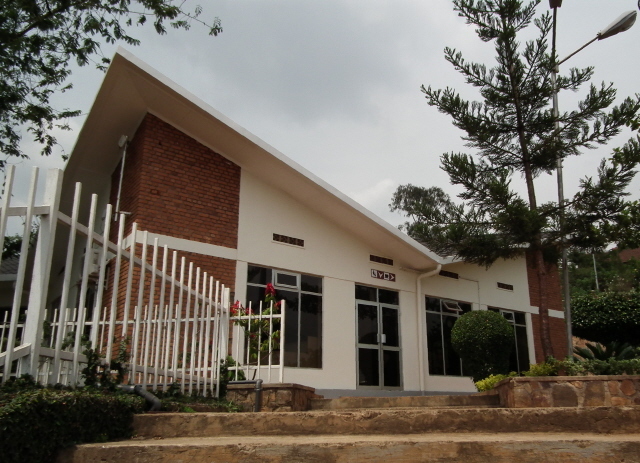 Unlike at the other Genocide Memorials, the Gisozi Centre also features a book and gift shop. Apart from souvenirs, including T-shirts, there's an extensive range of standard works on the Rwandan genocide, as well as few more rarely encountered volumes. The same goes for DVDs – some exceptional rarities are on offer here. This makes the shop a potential black hole for money – also given that prices are rather high. On the other hand, it's for a good cause … and you may not get a chance like this elsewhere. (I ended up spending nearly 100 dollars here …). All in all this is the most developed memorial museum commodifying the Rwandan genocide that there is, and its efforts are highly commendable. Its educational aim is clear – however the exhibition has to make compromises regarding the depth in which it can explore its subject matter. In other words, if you really want to understand the Rwandan genocide (and its wider context), a visit here is not enough. It may be a start (for many it quite possibly is), but to get into the topic properly you have to read some of the ample literature that's become available over the years – see under Rwandan genocide for a few recommendations. The centre's own documentation centre – especially its online incarnation – can also provide plenty of additional material. Still, whatever your level of previous knowledge may be, a visit to the Gisozi Genocide Centre is a must for anyone who comes to Kigali – be it as a first educational exploration, or merely as a kind of pilgrimage to pay your respects. Location: about two miles (3 km) to the north from the city centre of Rwanda's capital city Kigali, on a hillside in the district of Gisozi. Access and costs: fairly easy to get to, nominally free, but donations are welcome. Details: It's probably too far out to be within walking distance from the city centre, but if you want to get there independently (on foot, by bicycle or by car), these are the directions: from the main roundabout at the bottom of the northern end of Kigali city centre, take Boulevard de Nyabugoro to the intersection with Avenue de la Gendarmerie, across the Kinambi bridge, and then the first main road left, and left again and a couple of hundred yards the entrance to the main car park is on the left. Taking a taxi shouldn't be too expensive. Most visitors get here as part of an organized tour – and it is also part of the official city tour by bus – see under Kigali – but that may not allow enough time for a full in-depth visit. Better go independently. Opening times: 8 a.m. to 4 p.m. daily; closed on public holidays and the last Saturday of each month for 'umuganda' (public work days). Admission is nominally free, but you are expected to leave a donation, which you should do. The fee for hiring an audio-guide is (a rather hefty) 15 USD; if you buy the printed exhibition guide book "Jenocide" (also priced 15 USD) at the same time, you get a 5 USD discount. Students get 5 USD off both. Staff guide services are charged at a minimum of 100 USD (for groups of 4 to 10 participants, 125 USD for groups up to 15, 150 USD for groups up to 25 – half price for groups of students). There's also a fee of 20 USD for a photography permit for visitors (only inside the exhibitions, it's free for the outside parts of the Centre). Time required: at least two hours is a common recommendation. The running time of the audio-guide is just under one hour. But you'll need more time for the panels and videos in the exhibitions – and also allow sufficient time for reflection in the gardens and around the mass graves. The time you'll need will also depend to some degree on how familiar you already are with the history of the Rwandan genocide. 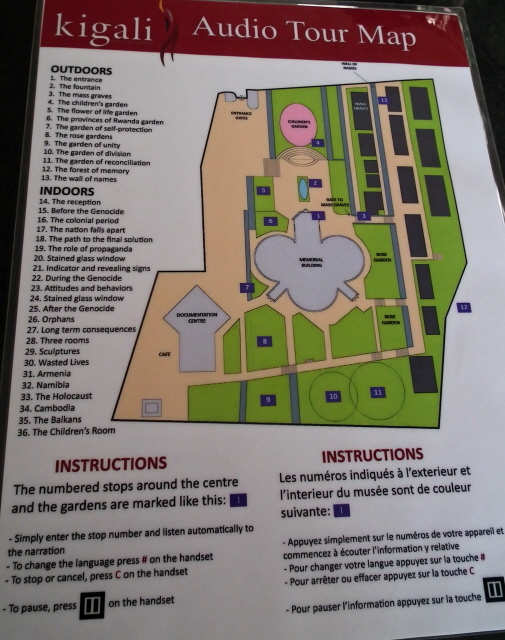 If you need/want to take in all the info available at the centre, then even two and a half hours may not be enough. Combinations with other dark destinations: There are a few sites associated with the Rwandan genocide in Kigali that can be combined with a visit to the main memorial centre Gisozi, the most significant probably being the Belgian Memorial at Camp Kigali. For more genocide memorial sites outside Kigali, see under Rwanda. Combinations with non-dark destinations: see under Kigali and Rwanda.